I will likely never sell all of my shares in Realty Income, because I consider this particular company to be a buy-and-hold stock. 'Buy and hold' means many things to many people, and I consider the power of compounding a significant part of the value proposition for owning REITs. That doesn’t mean investors should just ignore their stock portfolios; as much as I love these REITs, it’s critical to always be frugal. 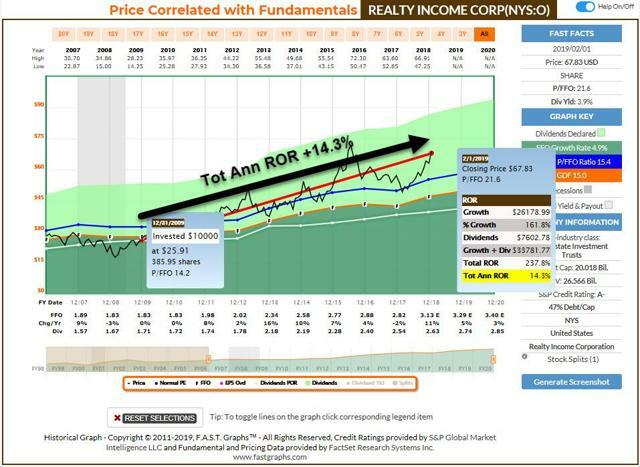 Realty Income(O) is a Buy, waiting on a pullback because of its modest overvaluation. 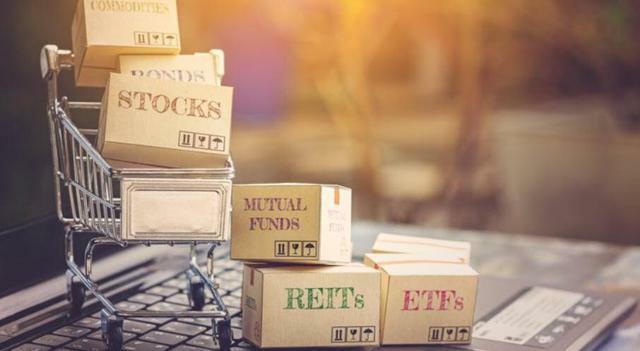 Investors should wait for its yield to rise to at least 4.6% before buying new shares, and if you want to earn double-digit returns from this monthly paying dividend legend than a 5% yield is a good target to have. There’s little doubt that shares in the monthly dividend company are becoming richer by the day, and at some point, I expect to be trimming; my trim target is $70. But when is it appropriate to unload all my shares in this prized “sleep well at night” REIT? The answer: I will likely never sell all my shares in Realty Income, because I consider this particular company to be a buy-and-hold stock. Forever is a long time to hold a stock. Most investors hold on to a stock for less time than the late Elizabeth Taylor held on to a husband. Depending on who you ask, the average holding period for a stock has been estimated as anywhere from 11 seconds to five days. Warren Buffett said "Our favorite stock holding period is forever," and when you look at the various holdings of Berkshire Hathaway, you can begin to understand why the Oracle from Omaha prefers a long-term buy-and-hold strategy. We can all debate the meaning of the word “forever,” but there’s no argument that the key to generating wealth is to utilize the power of compounding and the margin of safety concept. 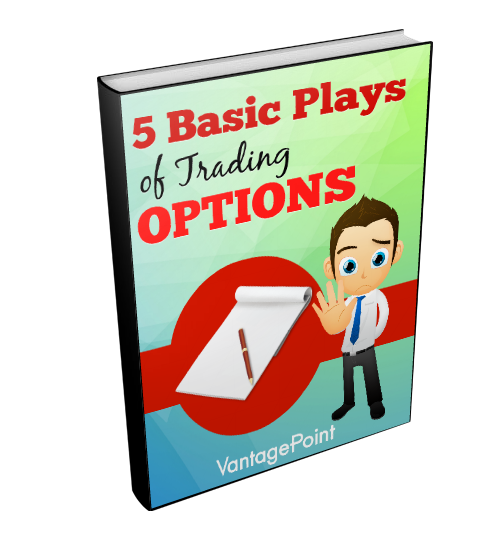 There is statistical proof that a buy-and-hold strategy is a good long-term bet, and in this article, I will provide 5 classic buy-and-hold examples within the REIT sector. W.P. 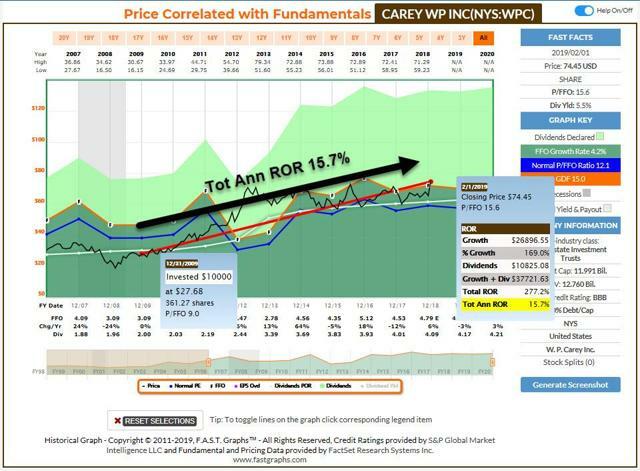 Carey (WPC): A few days ago I wrote on this high-quality blue-chip REIT and explained, “I consider W.P. Carey to be a classic buy-and-hold stock because the investor can take advantage of the power of compounding and is not really concerned with short-term volatility.” One of the primary reasons that I consider this REIT a long-term hold is because of its discipline, and ability to generate dividend growth through multiple cycles. For example, most REITs were forced to cut their dividend in 2008-2009, yet W.P Carey kept growing it. Also, W.P. Carey recognized that U.S. retail was going to experience store closures, so the company reduced exposure (just 4% exposure). The majority of retail exposure is in Europe and in sectors such as do-it-yourself and auto dealerships, which the company views as less exposed to the effect from e-commerce. Finally, W.P. Carey has maintained a healthy balance sheet (debt to gross assets will come down to around 45%) and ample liquidity (over $1 billion of capacity on its revolving credit facility). I thought it would be useful to illustrate W.P. Carey’s performance since the last recession. As you can see, the company generated impressive returns since January 1, 2010: Total Annualized ROR of 15.7%. Today we consider W.P. Carey soundly valued, and we recommend it as a BUY. Shares have +14% since January 1, 2019, but we believe that the company is still trading with a decent margin of safety, especially when you compare the company with industrial REITs like Prologis (PLD). We expect the company to generate returns of around 10% over the next few years, and dividend growth should continue to serve as the primary growth catalyst. Current Dividend Yield is 5.5%. 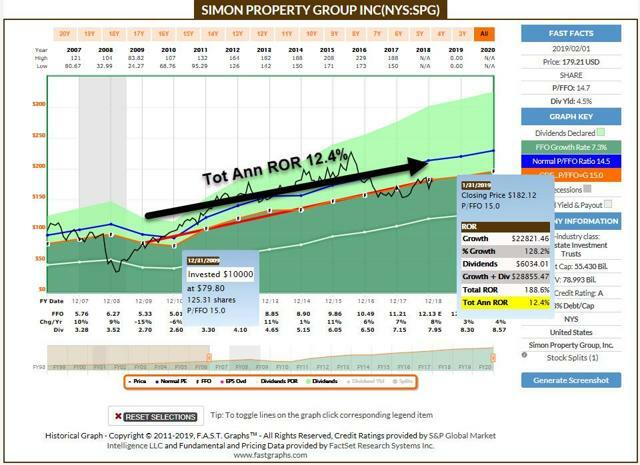 Simon Property Group (SPG): Last week Simon reported solid Q4-18 and 2018 Year-End results: For Q4, FFO was $1.15 billion or $3.23 per share, an increase of 3.5% year-over-year, and Full-Year 2018 FFO per share was $12.13, an increase of 8.2% year-over-year. Over the last four years, Simon has grown FFO per share on a compound annual basis of 8%. Simon also announced a dividend of $2.05 per share for the quarter, a year-over-year increase of 5.1%. There's always disruption in our industry, department store spaces that we reclaim either through lease termination or acquisition, we think will be beneficial in the long run. Simon’s balance sheet is in excellent shape, with more than $7.5 billion of liquidity consisting of cash on hand, including its share of JV cash, and available capacity under its revolving credit facilities. The company currently estimates net income to be within a range of $7.30 to $7.40 per diluted share for the year ending December 31, 2019, and that FFO will be within a range of $12.30 to $12.40 per diluted share. As you can see, the company generated impressive returns since January 1, 2010: Total Annualized ROR of 12.4%. We are maintaining our Strong Buy recommendation on Simon (shares have returned +7% so far in 2019) and although the company’s CEO expects continued bankruptcies in 2019, we believe the company is well-capitalized to benefit from redevelopment. Furthermore, Simon continues to adapt to e-commerce and we are attracted to the reported retail sales per square foot for the malls and outlets (was a record $661 compared to $628 in the prior year period, an increase of 5.3%). The current dividend yield is 4.5%. If there’s one thing income investors love more than generous dividends, it's dividends that grow every year, no matter the state of the economy. Recently, Realty Income became an elite S&P 500 company that has grown its dividend for 25+ consecutive years in a row. Since its IPO (1994), Realty Income has managed to not just massively outperform other REITs (O returned 16.3%) but also the S&P 500 (9.3%), the Dow (10.2%) and even the tech-heavy and growth-focused Nasdaq (9.3%). Realty Income is a stalwart of dividend excellence, and the two primary pillars for the company’s successful platform are cost of capital and scale. The company now owns more than 5,600 properties located in 49 states and leases its buildings to 260 commercial tenants operating in 48 diverse industries. To fuel the growth, Realty Income maintains a rock-solid balance sheet ($2.4 billion in liquidity under its revolver), and the company was recently upgraded to an A- credit rating... just one of nine REITs in America (out of nearly 400) to have an A- or better rating. Shares are getting a tad rich for newbies, but as noted above, I plan to hold onto my prized pick for as long as possible, maybe forever. Our trim target is $70 per share, but my objective is to become wealthy and let the power of compounding become my BFF (best friend forever). As my readers and followers know, I will ignore the short sellers who often come out of the woodwork when Realty Income gets pricey, recognizing that they are not informed and should learn to flip houses, not shares in an ultra-blue-chip REIT. As you can see, the company generated impressive returns since January 1, 2010: Total Annualized ROR of 14.3%. We are maintaining a "buy with a pullback," which simply means Realty Income is fully valued, and disciplined investors should exercise patience. As a long-term owner, I’m thrilled to see the momentum that validates this flight-to-quality trade, and I’m happy to see this blue-chip being recognized for its true excellence. Mr. Market has this one right, and I have no problem sleeping well at night. The current dividend yield is 3.9%. Digital Realty (DLR): Although data center REITs are relatively new, Digital Realty is one of the oldest data center REITs in the world (having IPO’d in 2004) and has the most impressive dividend track record in the industry — 14 straight years of rising payouts. More impressive than the growth record, however, is the fact that the dividend has grown at 12% over that time, basically in line with its adjusted funds from operation (or AFFO) per share. In addition to being a first mover, Digital Realty’s primary competitive advantages are scale and costs of capital. The scale allows the company to access low-cost capital to grow quickly through acquisitions. The company’s biggest acquisition was the $7.6 billion merger with DuPont Fabros that actually strengthened the balance sheet and made the company the second biggest data center REIT in the world. Most recently, the company entered into a JV with Brookfield Asset Management (BAM) to buy Brazilian data center giant Ascenty for $1.9 billion. Digital Realty’s balance sheet (rated BBB by S&P) ensures that the company can borrow long-term bonds at rates that are three times below its returns on invested capital and makes it easier to grow AFFO/share more quickly. That’s why the company is one of the best situated to profit from that growth: management's long-term guidance is for 7% to 9% AFFO/share growth, which analysts think will come in at 8%. As you can see, the company generated impressive returns since January 1, 2010: Total Annualized ROR of 11.7%. 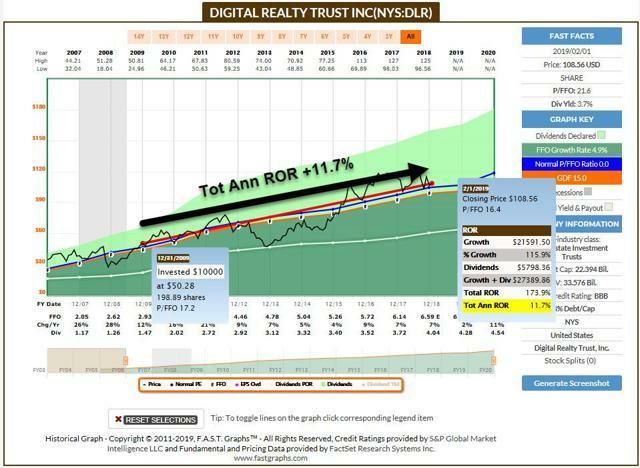 Digital Realty has returned 2.0% YTD (through 2019) and we are maintaining a BUY recommendation (note: we have Strong Buys on CONE and QTS). We are also overweight data centers and we believe that Digital Realty is a long-term trade. This REIT is a participant in our popular REIT Index, called DAVOS, and we believe that shares will generate returns of around 15% in 2019. The dividend yield is 3.7%. Federal Realty (FRT): A Dividend King is an S&P 500 company that has increased its dividend for 50+ consecutive years, and with such a high bar, it’s rather unsurprising that only 25 companies have achieved such stalwart status. Within the REIT sector, there is just one “king” and it's Federal Realty. To achieve that success, Federal Realty has built a highly diversified portfolio: no one tenant represents more than 2.7% of ABR (average base rent), the company has 2,933 tenants, and the top 25 tenants only account for 27% of ABR. Federal Realty has a fortress of a balance sheet (rated A by S&P and Fitch), and the company continues to improve and is very well positioned from a capital perspective (net debt to EBITDA ratio moving lower to 5.4x, down from 5.9x at the start of 2018; the fixed charge coverage ratio is higher: 4.3x versus 3.9x at the start of the year). Much of the success of Federal Realty has been the company’s focus on development and redevelopment (yields are between 6-12% vs. 4-6% stabilized cap rates, driving value creation). 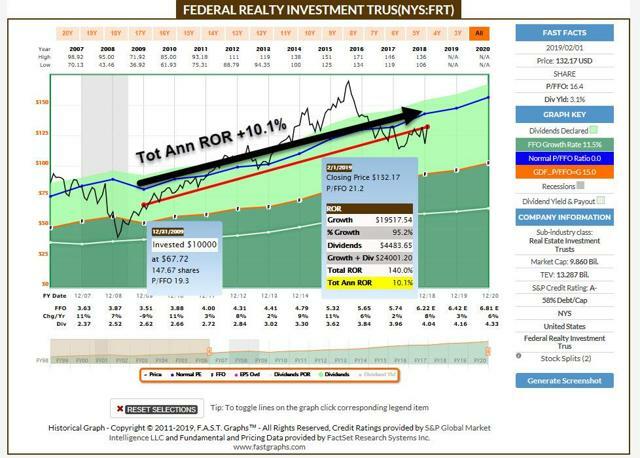 Federal Realty is the ONLY publicly-traded shopping center REIT to grow NAREIT FFO per share every year since 2010. Federal Realty and Simon Property Group are the only 2 out of 24 publicly-traded retail REITs to grow NAREIT FFO per share every year since 2010. Essentially this simply means that Federal Realty is “cycle tested,” as the stalwart REIT has maintained a best-in-class track record of delivering consistent earnings growth. As you can see, the company generated impressive returns since January 1, 2010: Total Annualized ROR of 10.1%. Federal Realty has returned 12.2% YTD (through 2019) and we are maintaining a Strong Buy, that means we expect shares to generate 25%+ returns over the next 12-18 months. Although we expect more retail bankruptcies in 2019, Federal Realty is well-positioned to take advantage of the opportunities, and we’re glad to see demonstrated experience at integrating uses such as retail, residential, office, and hotels (the company has developed ~4.6+ million SF and ~2,000 residential units of entitled mixed-use development opportunities within the portfolio). The dividend yield is 3.1%. In summary: Buy and hold means many things to many people, and although it’s almost impossible to venture out as far as forever, I consider the power of compounding a significant part of the value proposition for owning REITs. The market goes up more often than it goes down, and compounding the returns during good times yields a higher overall return, as long as the investment is given sufficient time to mature. The way to wealth is as plain as the way to the market. It depends chiefly on two words, industry and frugality: that is, waste neither time or money, but make the best use of both. Without industry and frugality nothing will do, and with them, everything.